The esteemed Roger Ebert once wrote that noir was “the most American film genre, because no society could have created a world so filled with doom, fate, fear and betrayal, unless it were essentially naïve and optimistic.” Akira Kurosawa’s “Drunken Angel” (1948), then, fits so perfectly into noir despite being made and set in Japan because it was released in 1948 during the American occupation post-WWII when social reforms inspired by the above-mentioned naïve and optimistic society were being introduced. No Americans are ever seen, however, because Kurosawa knew the real struggle was within the Japanese people itself. To that end, all the notions Ebert cites, the doom, fate, fear and betrayal, are given life in the acrid, disease-ridden pond at the center of the slums where the eponymous Drunken Angel, Dr. Sanada (Takashi Shimura), lives, and who often finds himself chasing kids away from the noxious water and staring into it like it’s the abyss. Maybe it is. No one ever comes to clean it up. 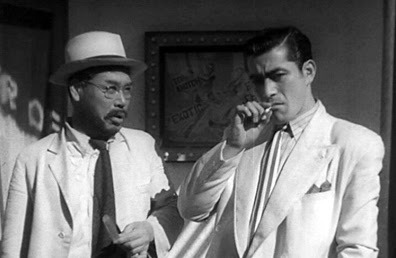 That sense of societal disease extends to Matsunaga (Toshiro Mifune), a Yakuza who shows up at Sanada’s practice in the dead of night as the movie opens, seeking treatment for a broken hand. It quickly becomes clear, however, that Matsunaga’s wound stems from a bullet, which Sanada extracts, though this unearths the revelation that the gangster also suffers from tuberculosis. This diagnosis is both dismissed and dreaded by Matsunaga, seeming to think that the TB, a la the acrid pond, might just go away if it’s ignored. Sanada knows better than this, and he also knows that if Matsunaga fails to deal with his afflictions, health or lifestyle, that he will end up in the same situation as the drunken doctor, a parallel the movie teases out and eventually makes explicit in a monologue. Sanada’s good deeds, in fact, reach beyond his attempts to save Matsunaga, as we come to learn that Miyo (Chieko Nakakita), the doctor’s assistant, was once involved with Okada (Reisaburo Yamamoto), a jailed Yakuza who once ruled Matsunaga’s territory. And when Okada is released, he seeks out his old flame, only to be repelled by the impervious doctor. Famously, “Drunken Angel” was the first of sixteen collaborations between Kurosawa and Mifune, and the reason why is evident in how the latter commands the screen with a charismatic force even as his character is literally wasting away. In a sense, Matsunaga spiritually embodies the hubris of Imperial Japan and the Yakuza while physically embodying their rot, as even in scenes where he is at his most sickly, barely able to stand, swinging his arms wildly, he remains defiant against the obvious diagnosis, not necessarily as if he knows best but cockily, stupidly resistant to who knows best. In these moments he resembles someone not just drunk on power but actually drunk, linking him, in a way, with the doctor, who goes so far as to swill medicinal alcohol to attain his fix. A habit can barely get nastier than that, and Shimura lets such nastiness inform his performance, one impressively indifferent to sympathy, though it is not liquid courage that makes his character stand up to this Yakuza so much as something like a moral breaking point, a mad as hell and he’s not going to take it anymore insistence. That is why he keeps trying to track down Matsunaga even while claiming not to care about the gangster’s fate, which, weirdly, you actually kind of believe since every skeptical gesture and line reading by Shimura suggests that his doctor is essentially just laughing in Matsunaga’s face. If the push and pull is entirely between these two men, that changes mid-movie when Okada returns and, almost by default, Matsunaga falls back into Okada’s company, which Mifune plays like he is going through the gangster motions, quietly skewering the expressed notions of Yakuza honor, of always keeping one’s word, a lie laid bare when the character discovers his Yakuza overlords are just waiting around for him to die. If it is cliché to say someone is living a lie, in this moment, with his pitched forward stance and stunned expression, Mifune lives that bitter sentiment out, so spectacularly he stops the movie in its tracks so Kurosawa can just hold the shot. And while another movie might have built to a confrontation between Matsunaga and Sanada, “Drunken Angel” instead devolves into hostilities between Matsunaga and Okada. If Matsunaga is attempting, in his own way, to defend Miyo’s honor, it is nevertheless purposely portrayed as ridiculous, not a thrillingly choreographed duel but the two men writhing around in spilled paint. If it embodies the film’s overriding hopelessness, Kurosawa adds a conclusion suggesting hope, with Sanada and a young patient who succeeds in beating in TB. It might well ring false when compared against the typical fatalism of the genre. Yet if the era into which “Drunken Angel” was released found Japan trying to remake itself then perhaps, cosmically, or just through the prism of time, we can read this conclusion as the epitome of the genesis of those reforms, a slight rewiring of noir not as grim determinsm but societal self-actualization.